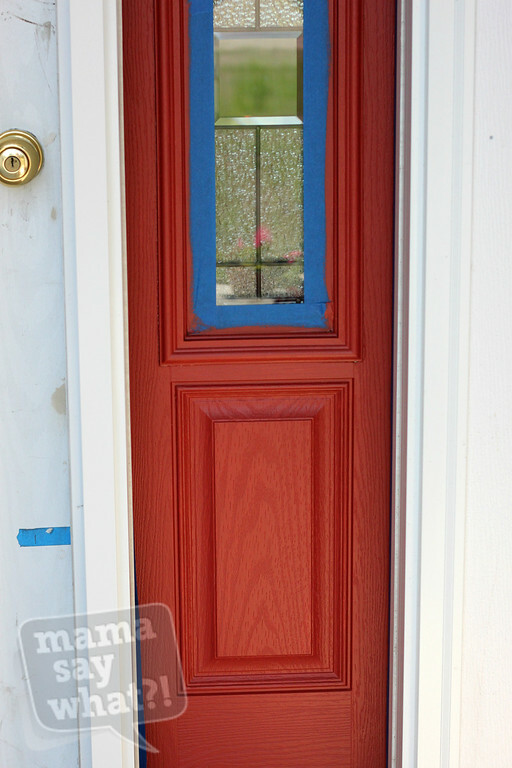 DIY: Jazz Up Your Front Door Mama Say What?! | Mama Say What?! I love seeing houses with beautifully painted front doors; it’s very popular right now! But if you want yours to stand out among the rest, try glazing it! 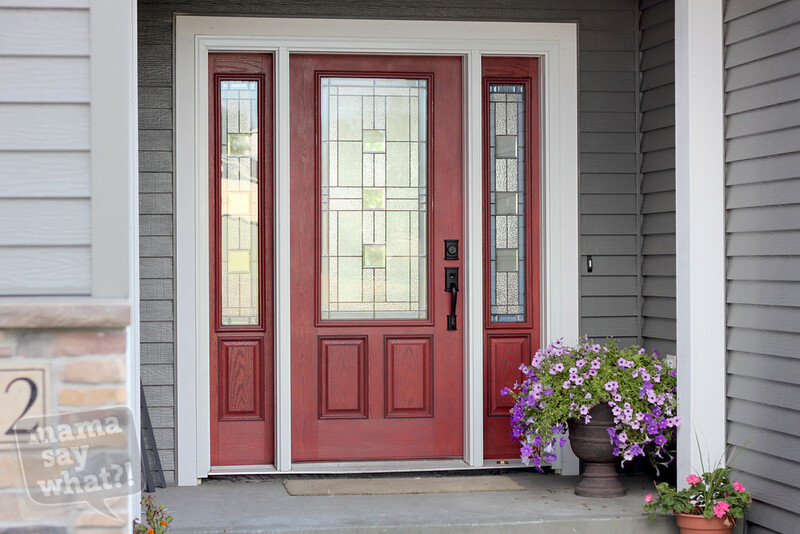 It’s a quick and easy way to make the details in your door pop and make your house stand apart from all the neighbors. 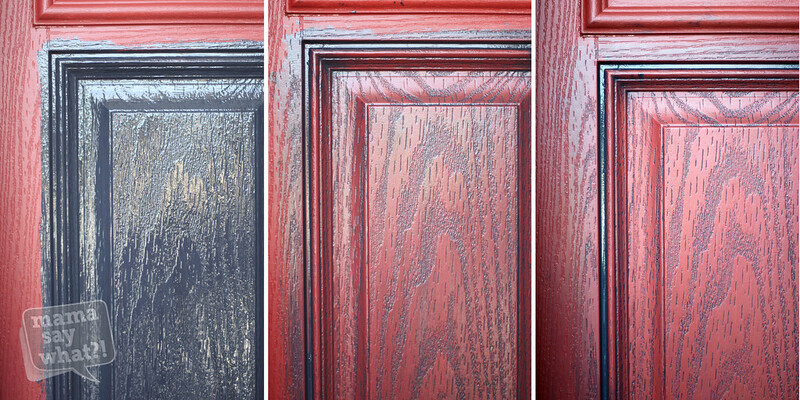 I was starting from scratch with a brand new door, but if yours has been painted before you might need to sand some of the rough areas where paint is chipping. Feel free to remove your door to make it easier to paint. Don’t forget to tape off any areas that won’t be painted (glass, windows, etc). 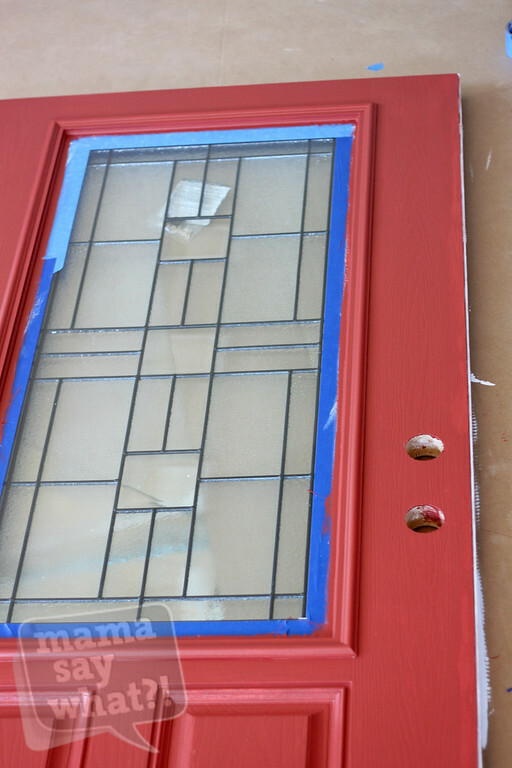 Once your door is nice and smooth, it’s time to prime it. I had a big can of primer from a previous project, so I went with that, but you can use spray primer for this as well. Just paint it on, making sure to get your brush into all the little cracks and crevices. I did two very light coats of primer. 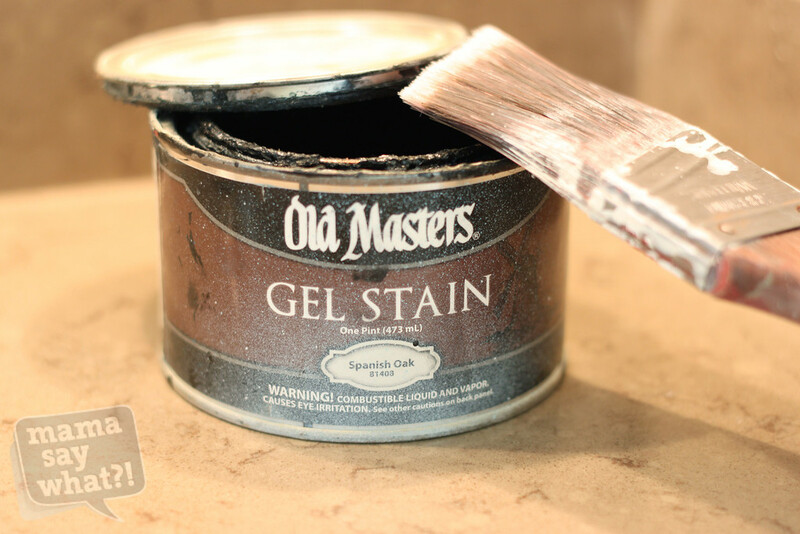 Make sure you let each coat completely dry before the next. Once the primer is dry, you are ready to start painting. Just like with the primer, I painted two light coats of paint, letting each coat completely dry before the next. You can use a small roller for the flat parts of the door, as it doesn’t show brush strokes like it would using a paint brush. I have two sidelights at my front entry so I chose to paint those the same color as my door (The door you see here is just a temporary door). Once my door and sidelights were completely covered with red paint, I decided they needed a little something extra. Actually, it was my mother-in-law who came up with the idea to use a grey glaze, and I’m so glad she did! So, off I went to my local Hirschfield’s paint shop to see what the best ‘glaze’ would be. What they gave me is actually a black gel stain with a few drops of white paint added to it to make the grey color; it worked perfectly. Here, the left side is glazed and the right side is not. It just makes the door details ‘pop’ don’t you think? All you do is take a ratty old paint brush (the older, the better) and work your way around the door, section by section. Brush it on completely. Now, getting it into all the little crevices is VERY important for this step, because that’s where you want it to stick. Once it is brushed and blotted all over, take an old rag and wipe it completely off (I stole one of my husband’s white T-shirts for this. Shhh!). What’s the point of brushing it on and then wiping it off, you ask? Well, as you can see, it sticks into all the places where it needs to stick and wipes off the smooth surfaces to reveal your beautiful paint color underneath. 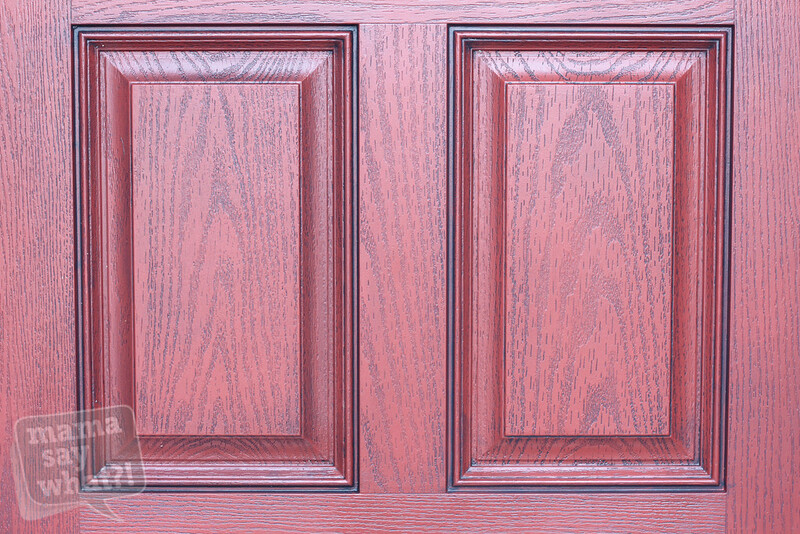 It also makes the door look like real wood by sticking into the grainy areas. Continue to do this around your entire door and that’s it. Easy Peasy! You now have a beautifully glazed front door. If you want the glaze to pop out even more, you can certainly go through and do the exact same glazing process a second time. Try it out and let me know how it goes! Added by Heidi C. on August 18, 2012. Do you happen to know what the name of the color and paint brand is that you used?